A basic introduction to self directed stock investing, basic technical indicators and charting, long term vs short term trading, mutual funds vs ETFs and index tracking stocks…everything you need to know to advance to the next level (options and more advanced technical analysis, swing and trend trading, index options and spreads, etc). 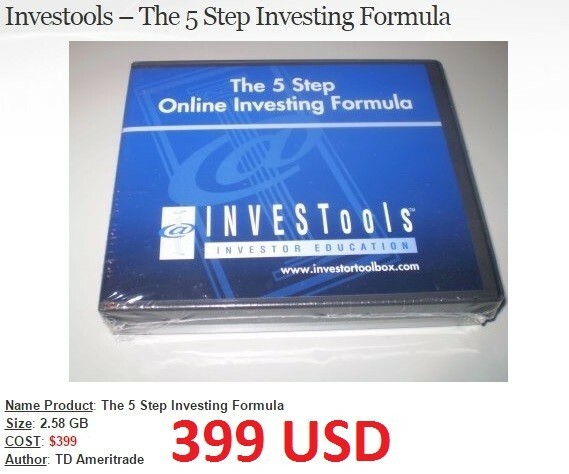 This is the original 4 DVD “Investools PHD Course, Basic Stocks – 5 Step Investing Formula” and the pdf manual. This was a live class filmed and given to students. Production quality and sound are excellent and cuts back and forth between the speaker and powerpoint slides are seamless and well integrated. It does NOT simply read from the PDF manuals, it expands on them, offering real life charts, examples, and demonstrations of practical application.